As your small business grows, the day may come when it’s time to move from your garage or home office to a more visible presence in a shopping strip or office. But there are significant differences between residential and commercial leases, so it’s important to know what you are getting yourself into before signing on the dotted line. Many business owners focus on things like the property’s size or the office décor, rather than giving careful thought to the financial and legal aspects. If you rent commercial property as your business premises, the rent is tax deductible and you are also usually able to claim GST credits. It is also worth getting professional advice before deciding to buy or lease equipment for your new premises. There are significant tax benefits available with both financing approaches, so you need to carefully weigh up whether leasing or purchasing is the best tax choice. A key point to consider when selecting new premises is whether the lease agreement is considered a retail lease, as each Australian state and territory has special legislation covering retail leases. This legislation imposes special obligations on landlords and gives extra protection and rights to retail tenants, so check early on whether your potential premises are covered. 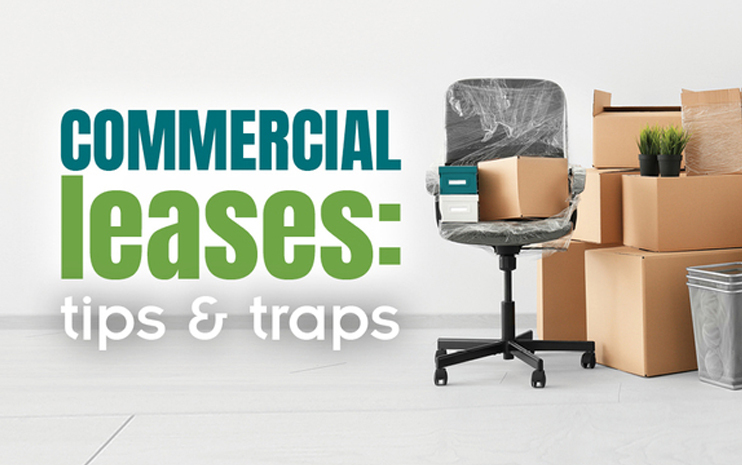 Commercial leases tend to be fairly generic rather than tailored to the specific property and tenant, so it’s worth reading them closely. Make sure everything you negotiated is documented and there are no clauses that could have unintended consequences for your particular business. Also ensure the lease covers both the premises you inspected and any parking spaces to avoid disputes in the future. Other important points to check are the period the lease covers, whether there is an option to renew the lease and how this option can be exercised. Although landlords usually want a long initial term such as five years, a growing business may find it preferable to negotiate a shorter initial period – such as three years. Given the high cost of fitting out business premises, also consider if the lease term is appropriate for getting value from this expenditure. Another common mistake is to overlook checking whether you can legally use the premises for the business you want to run. If the local government doesn’t approve that type of business, you won’t be allowed to do so, even if the lease permits it. Rent can be a significant expense for a growing business, so ensure the rental amount and rental review are clearly outlined in the lease before signing. A rent review based on the CPI or a fixed amount is usually applied annually for the duration of the lease, while a market review typically takes place at the end of the initial term and each option period. Business tenants generally need to provide security against the possibility of failing to pay their rent. This can be a bank guarantee equal to three or six months’ rent, or a personal guarantee from the company directors. If you decide to walk away from the lease contract, both the business and any guarantors can be sued by the landlord for rent that would have been paid if the lease continued. Although the landlord should reduce this amount if they find a replacement tenant, this can take a long time and you are required to pay whether your business is in the premises or not. And don’t skip the fine print. Small points in the lease such as a requirement for the landlord to operate and repair the air-conditioning can be easy to overlook, but are vital when things go wrong. It is also essential to check what is required to ‘make good’ the premises at the end of the lease, as these costs can add up quickly. Next Post Cars and tax - what can you claim?